If you’re looking for an affordable laser rangefinder that can give you everything that you need and want, then stop right here. If you want to save some money, but still find a high performing rangefinder without being “too cheap”, then I’ve got the brand for you. You don’t have to give up on quality, accuracy, or super cool features to find a rangefinder that fits within your budget. Just stick with this Nikon golf rangefinder review and you’ll get the nitty gritty on Nikon’s COOLSHOT rangefinder line. Nikon has quite the collection when it comes to rangefinders, and their golf line has something to offer every type of player. They’re a well-known brand that’s been in the game for a long time, and they’re loved for their quality and their affordability. If you’re thinking of being a Nikon user, you’ll join the ranks of a multitude of satisfied customers. Sorry, but you’re not the first to discover one of the best kept secrets in the sports optics world. 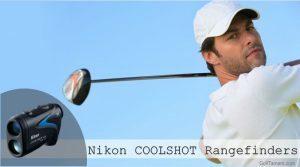 The COOLSHOT line is Nikon’s golf rangefinder progeny and their motto is “gain confidence”. With First Target Priority Mode as the platform for their pin seeking technology, small and compact designs, and especially the wallet-friendly prices, it’s a give-in that you’ll be confident with every swing you make. This is similar to the First Target Logic mode the Leica Pinmaster II Golf Rangefinder has. Before we get into the individual reviews of the COOLSHOT rangefinders, check out the table below for a summary of their features.